Looking to pick up a Vive soon? Well HTC have announced that if you do, you'll get Fallout 4 VR for free! 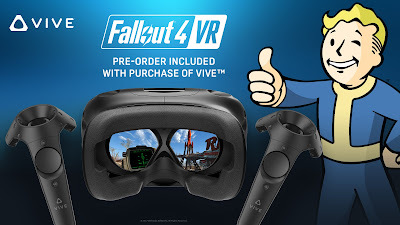 From today, customers who purchase an HTC Vive from vive.com or an authorised retailer, will receive a free redemption code for Fallout 4 VR, a £39.99 value, which launches on December 12, 2017. Fallout 4 is an action role-playing video game developed by Bethesda Game Studios and published by Bethesda Softworks. It is the fifth major installment in the Fallout series, and was released worldwide on November 10, 2015, for Microsoft Windows, PlayStation 4 and Xbox One. The game is set within an open world post-apocalyptic environment that encompasses the city of Boston and the surrounding Massachusetts region known as "The Commonwealth". The main story takes place in the year 2287, ten years after the events of Fallout 3 and 210 years after "The Great War", which caused catastrophic nuclear devastation across the United States.